This top-selling Latin setting by Greg Gilpin is now available in SATB, SAB, and 2-part voicings! 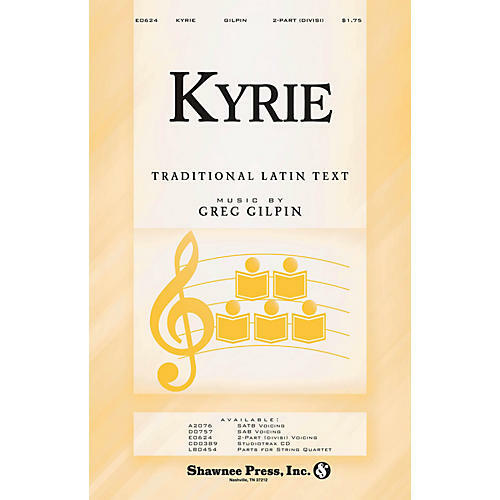 Kyrie consists of a child's theme that begins the piece with the text developing into rich, heartfelt harmonies. The piece concludes with the same child's theme fading into pianissimo as if never ending. It has been newly recorded with available string quartet parts and a new StudioTrax CD recording. A translation and pronunciation guide is included within the choral. This is a moving and stirring choral work! Available separately: SATB, SAB, 2-part, Parts for String Quartet, StudioTrax CD.